Merry Christmas from Mexico, one of our stops-I've lost count-on the Christmas Around the World series here at Prudence Pennywise. The festivities in Mexico begin on December sixteenth with a nine day procession called "Las Posadas" Children representing Mary and Joseph roam from house to house looking for a room in the inn for Baby Jesus. 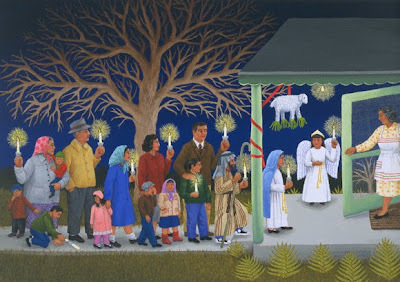 After the last posada parade, families attend a special midnight mass and baby Jesus is placed in the manger scene, having at last found a resting place. 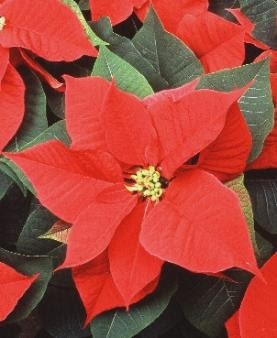 The iconic Christmas flower, the poinsettia comes from Mexico, and legend has it that the flower's pointed petals represent the Christmas star that led the shepherds and wise men to the baby Jesus. The giving of gifts happens on Kings day, January sixth. Like many other countries, Mexican children put out their shoes and wait for the Three Wise Men to leave them little surprises. And yet, having grown up in southern California, my favorite Mexican Christmas tradition is the giving of tamales. Mmmm! It didn't seem like the Christmas season was in full swing until our Mexican friends brought us a giant bag full of the delectable savory corn cakes filled with meats and chiles. They were so delicious that we had to learn to make them ourselves. I have to hand it to my mom for always taking the opportunity to learn from others. Although I balked a little at the time, on three separate occasions my mother invited Mexican friends to our home to teach our family to make tamales. I'm so grateful now that my mother realized how important it was to share traditions, ideas, and recipes from other cultures. Making tamales is a long and drawn-out process, albeit an enjoyable one, especially if you make them in a group. (Tamal making parties, or "tamaladas" are common in December in southern California.) I've been making tamales for the last decade, sometimes alone, sometimes with others. I've tweaked a couple of different recipes and I think this version, with a combination of fresh corn and dried corn flour, is the absolute tastiest. I filled some tamales with shredded chicken that has been simmered in tomatillo salsa, and some with cheese and green chilies, and some with all three. You can fill it with whatever your heart desires! Money Saving Tips: If at all possible, visit a Mexican market for your ingredients. You'll end up with a large bag of masa mix. Next month I'll show you how to make tortillas with that masa so that it doesn't go to waste. You can easily double this recipe to make a larger batch, so that you won't waste any of the corn husks. In a large bowl, using a pastry cutter or two knives, blend masa mix, butter, sugar, salt and pepper until crumbly. IN the bowl of the blender, combine broth, half of the corn kernels, cheese, and baking powder. Process until smooth. In the large bowl with the masa mix, add pureed corn kernels and remaining corn kernels. Mix well. This will be your dough. For each tamal, open one corn husk. Place a scant 1/2 cup tamal dough in center. (You'll get used to eyeballing it. You'll use more for bigger husks, less for smaller.) Press dough down into rectangle shape, leaving 1 inch borders all around. Put about 2 tablespoons filling in the center of dough. Wrap tamale dough over the top and around to form a cylinder of dough with filling completely enclosed. Fold up ends of corn husks around tamal dough. Fold waxed paper around tamal into a little bundle. (I don't bother tying the tamales, since wrapping in waxed paper works just as well, is faster, and it keeps them fresher afterwards.) Repeat process with all tamales. Feliz Navidad and best of luck! I LOVE tamales!!! Now I'm craving them! YUM! Gracious! What a post. It looks like hard work paying off with the best of traditons! Yummy. Oh yum! It's been a while since I made them from scratch. I've loved all the stops you've made as you've celebrated Christmas around the world. This one is no exception. Thanks for the recipe. As always, interesting traditions from around the world! Thanks for continuing the tour. I have been eating tamales for years and I will swear that these are the most delicious ones that I have ever eaten. They are so good and not shorteningish taste to them. I love, love, love tamales but have never tried to make them. Your step by step guide will walk me through it. Can't wait to make these. I love tamales and these look wonderful. I think I may need to get the ingredients and make them during our next snow storm! Ohhh -- those tamales look wonderful!!! Thank you for the tutorial on how to make them. YUM! Oh how I love your tamales. I pine for them. Thankyou for sharing all of your variations here. I had decided not to do tamales this year, but now that I see yours, perhaps I've had a change of heart! These look incredible. What a wonderful varation on the cookie-making party! These would be a ton of fun to make with a group. I'm really enjoying this Christmas Around the World series! Your blog is so nice with all the stops around the world. I really enjoy reading it. Wow! I have always wanted to make Tamales, now I know how... nice detailed procedure! Thanks! I have really been wanting to make homemade tamales for about a year now. I almost braved it last year for Christmas Eve, but talked myself out of it. Now that you have shown a step by step, I am determined. Your mom sounds great- I love how she invited people to show you all how to do this. Great traditions! I've never made tamales. I'm really not a fan, but I think it's because i've received inferior ones all of my life. I am just good making stuffed cornbread and adding lots of fresh corn kernels to it. But I will try to make them in the near future. Just to say I've mastered the skill. Thank you for sharing. I just had tamales at my office Christmas party! It's a good thing or I would have had an undenaiable craving! I love tamales, though I've never made them myself. Perhaps this will be something I try in the New Year. They look great! i remember going to your mom's once to have marina teach us how to make tamales. i'm afraid that i've never made them since, even though i love tamales. it was just so much work. yet, i haven't found a good spot to get them here in northern cal. i always want to eat these on christmas night, when i'm tired of prime rib, ham, pies, cookies, etc. then some earthy, spicy, comforting mexican food is just the thing. wait. did i just understand heidi's comment? or is that someone else in your family posing as her? when is she due? i need to call you guys! Wow - these look soooo good! Oh, yes! Heidi's number four will be making an apperance sometime in March. Your tamales look amazing Erin! A couple of years ago my friend Eliza came over and we made corn tamales together. She taught me how and they were wonderful! I posted your mom's cinnamon rolls today, they were delish! Goodness, I like tamale very much, but never be able to make my own. This absolutely worth trying. I haven't had tamales in YEARS! I had a friend who learned to make them from his mom from scratch... should've made him teach me! Thanks for the post. I just cooked 6 dozen tamales last night. My mom left me her "tamalera". Steamer to cook tamales. You do things a little different from how we make them, but they still look delicious! Maybe you don't need to do this with the masa that you make, but with the masa that my mom uses we always have to make sure we are using the smooth side of the corn husk to spread the masa on, otherwise its a bit more difficult to unwrap. Another good way to heat up tamales in the microwave, especially if they are frozen, put them in a ziplock bag and microwave them, leave the bag open a bit. That way they don't dry out as much, or heat them up on a griddle with the husks still on. They are a bit more crispy, but they are still delicious. Thanks the recipe and the trip around the world. I'm really enjoying it! A tradition we have faithfully fulfilled every year for the last 46 years. Tomatillo and pork, Chile ristra and pork and a few sweet ones with the left over masa. Good post. I love these tributes to traditions around the world. I just love them! You did a wonderful job describing the tamal-making procedure. I cannot wait to make tamales on my own one day. Ningun problema. Sabe que, aunque yo hablo espanol, no tengo idea como poner las marcas en la computadora, ni la tilde. Que verguenza. Ayudame! Gracias por venir. Buena suerte con las tamales. YUM YUM YUM! I love tamales! I LOVE Christmas tamales! My dad would order a huge batch of them every year from his office manager (her mom made them), and she would always make them extra spicy for us. Her mom passed away recently though, so no more yummy tamales! :-( I have always wanted to try my hand at making them, and I think it's high time I finally do! When we get back home after New Years it's going on my To Do list! Thanks Prudy! Depende de la computadora que tienes. Si tienes un PC, se pone los acentos con "alt" + "173" para la marca exclamativa. Hay códigos diferentes que corresponden a cada marca o acento. Si tienes un MAC, se pone la marca exclamativa con "opción" + "e" + "!" (creo que sí jeje). Si estás usando un laptop, vas a tener que añadir el idioma "español" al teclado. Si no quieres hacer eso, puedes ir a Microsoft Word y usar "symbol" + la marca exclamativa invertida. Después, cópiala y ponla en tu blog. Espero que toda esta información te sirva. ¡Feliz Navidad! (ooo, ¡puedes copiar la marca que acabo de poner aquí!) Sería mucho más fácil así. I've being tamales at Christmas for a few years now. We did a quadruple batch of your recipe Friday and my family declared it by far the best they've ever had! They freeze beautifully and make a yummy breakfast. If you're close to a Trader Joe's, you'll find excellent frozen corn there (including roasted corn). Thanks for sharing a wonderful recipe! Did you ever try cooking your tamales in a can?